Getting the proper nutrients into the body on a daily basis is often the most overlooked aspect of leading a healthy, productive lifestyle. This sounds simple, however it is becoming more and more difficult to do because of the lifestyle changes and eating habits we have developed over the years in the United States. We always recommend eating foods that higher in nutritional value but we realize that is is not always practical in the modern world to eat the way we should. That's why we recommend supplementing with whole foods. Not all supplements are created equal. At Standard Process, quality is an integral part of each step of the production process. They manufacture their products to preserve the quality of whole food constituents using research, innovative technology, and organic farming. We carry many of the core supplements for daily use, however many other supplements are available for specific conditions and can be ordered and shipped right to your house. 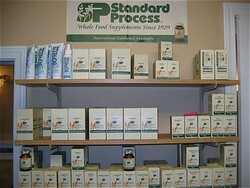 Standard Process is the sole distributor of the Herbal Supplement line made by Medi-Herb in Austalia. After years of researching domestic manufacturers of herbal supplements, Standard Process began to look outside the U.S. and found That Medi-Herb was far superior in the quality of their supplements compared to U.S. manufacturers.